While lost on vacation in Madagascar, Scarlett stumbles across a reserve where all of the animals are falling sick for some unknown reason. Is it their food? Is it the soil? Or is it something more sinister? Well, knowing the feisty Scarlett, she is not about to pass up this opportunity to make things right and take down those responsible for it. 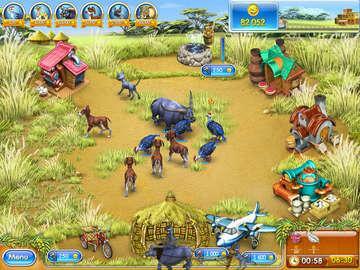 Put Scarlett's ranching skills to good use and help heal these wonderful creatures in this zany new escapade. Manage 90 levels of fun new activities like starting a gem store, baking mega cakes, and selling souvenirs. Play with new indigenous animals including elephants, ostriches, water buffalo, and watch out for those orangutans! With more 15 buildings to upgrade, two game modes, cool trophies, and 19 more visual gags, this adventure is the wildest of them all. Scarlett our true heroine is still working its way to help people the best way she can. But after serious helping to other people she has done her maximum and it’s time to take a break. Madagascar sounded like an exotic location for her to visit and see some wild life and to relax a bit. But knowing Scarlett a tour guide is not an option then she must explore the island by herself. She didn’t need much time to get lost in the woods, which marks the beginning of her adventure. She stumbles upon an animal reserve, which is full of sick animals. Surprised with what she sees, she asks around the reserve and discovers that they don’t have enough money to buy medications for the animals, which represents a very big problem. Everybody who played Farm Frenzy knows that Scarlett is a creature with a great hearth and something like that can’t be happening if she can do something about it. 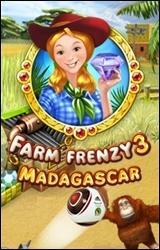 Farm Frenzy 3 – Madagascar is the fourth sequel to the Farm Frenzy 3 series, and many things have changes, but also stayed the same. Farm Frenzy is game about farming, where our heroine helps different people in need, like astronauts in the Russian Roulette, or running a farm for the US in the American Pie, etc… Now she is going to help the animals on that island. With the change of environment there is of course the change of animals you use for farming and producing and making different products. But those who have played the game will definitely see the great similarity in the great change. It might sound confusing, but it is like that. Farm Frenzy probably sticks to the formula, “It worked before, and it will work again”. 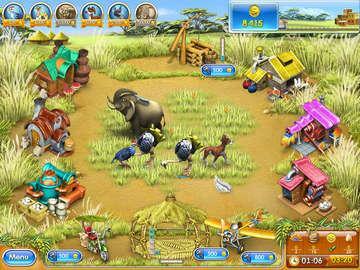 The game’s core stayed the same 4 animals are given, that produce goods and two animals as helpers. The goal of the game like said is to help the animals and you help them collecting money for the medications. Every level in the game has different goals that must be fulfilled to move on to the next one. Completing a level isn’t such a hard job. Finishing it in the silver or better yet in the gold time is a challenge for itself. The game structure, for those that aren’t acquainted looks like this: In the beginner levels, Guinea birds will be sufficient for you to finish the levels. They represent chickens from the past games, and they will be hatching eggs. This goes the same for other animals. Those basic products then will be used to create products for further processing, which differ in what you need. There are different buildings that will be used to process those produces which are all upgradable. Every upgrade level gives faster production and another additional product of the same kind to be processed simultaneously (the first level lets you produce one egg into flower, and the second level produces faster, but you can produce two eggs, and so on…). 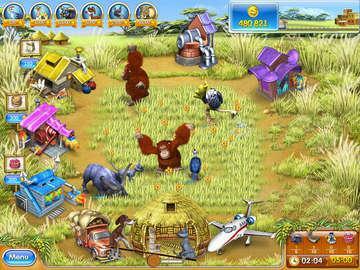 You collect the products clicking on them, but between feeding animals, ordering products you need to combine with yours to get a final product, like a cake or a pie, selling the extra products and the final products, things start to get hectic, as you progress further in the game, especially as orangutans stop by for a visit. Orangutans are the previous bears, and they scare away your animals, or can even disassemble your buildings. The two additional helper animals stayed the same, a dog and a cat. Cats help you in collecting items, and dogs paralyze the orangutans stopping them causing mayhem. But you always have to keep your eye on the products storage. You will need to expand it from time to time as it gets pretty full, and you need more space to manipulate items. Basically we are dealing with the same game, but with new look. But there is some newness to the game. Two game modes are there, 90 levels to challenge you even further, new special animals even if it isn’t such newness, the elephant digs diamonds for you, 19 different animated gags, and adventure of a life time. The graphics of the game even if looks the same, it gets more and more upgraded, which is logical, but those who played the game often might not see that at first. If you liked the previous parts you will definitely like this, even if some will dislike the lack in originality, the game stays true to its fans and still delivers the same amount of challenge and fun as before if not even more.